Sticker shock. It’s not a feeling I experience often after 17 years of working as a restaurant critic and food writer. My idea of value is likely different than most. I long ago became inured to the idea of spending a significant chunk of the rent for a blowout omakase experience at my favorite sushi bar. But when I paid a smidge less than $14 for three doughnuts at General Porpoise Doughnuts, where employees are now paid $15 (or more) per hour, I felt it. These are fancy doughnuts—tender, fluffy, and filled with really good house-made jellies and creams. Still. There I was, calculating just how much I’d spent. Three doughnuts at $3.85 each, plus a 10 percent service charge, plus tax. As all businesses gradually adjust to paying Seattle’s $15 minimum wage, restaurants face a particular challenge: how to make up for the increased hourly wages for service staff (some of whom are used to making much more than that when wages and tips are combined). And for diners, who will likely pay more for their meal, the challenge is what to do about tipping. In the current restaurant finance model, restaurants pay servers and busers the minimum wage, and those employees rely on tips (averaging about 17 percent) to make up for a low base wage. Kitchen talent—the pastry chef, line cooks and the chef—usually earn higher than minimum wage, but ultimately less than front-of-the-house staff, because they don’t get an equal share of gratuity. Prep cooks and dishwashers make less than kitchen talent—but usually more than minimum wage, depending on experience. Restaurants survive on slim margins, so raising the service staff’s pay $5 per hour (the minimum wage prior to the Minimum Wage Ordinance was $9.47 statewide) while maintaining the rest of the finance model as is simply isn’t an option for nearly every restaurant owner I spoke with. Many are unsure of how (and when) to try out a new model, although they acknowledge that either menu prices will go up enough to cover higher labor costs, or tipping must go away in favor of a “service charge” divided among the entire staff. Related: Should the Government Decide Who you Tip at Restaurants? Ivar’s, the 78-year-old seafood restaurant group that operates 26 restaurants and more than 20 concession stands, took a bold approach. The company eliminated tipping from all of its Seattle restaurants a year ago and adjusted the salaries of all employees to $15 per hour or higher. Prices at the full-service restaurants went up by 21 percent to incorporate the average gratuity left by customers (17 percent) as well as an increase in overhead (4 percent). Initially, the tip line was eliminated from Ivar’s receipts, but recently was put back in because several regular customers insisted on the option. And therein lies the rub for customers—many of whom are likely to be uncomfortable not leaving a tip, despite paying significantly more for their meal. What’s a diner to do? Some restaurants are trying to help customers navigate the new tipping world. At Matt Dillon’s Upper Bar Ferd’nand, the menu states that it is a “no tip/no service charge house” and that the menu prices are inclusive of business prices. The same is true at Jerry Traunfeld’s Lionhead, where the menu prices include the service—and any additional gratuity is at the diner’s discretion. Diners who order takeout pay between 15 percent and 20 percent less for their food. Other restaurant owners have taken a different approach: a service charge added to the bill and distributed more equitably to all staff. At press time, three of Tom Douglas’ restaurants (Palace Kitchen, The Carlile Room and Dahlia Lounge) and Renee Erickson’s five restaurants (The Whale Wins, The Walrus & the Carpenter, et al.) 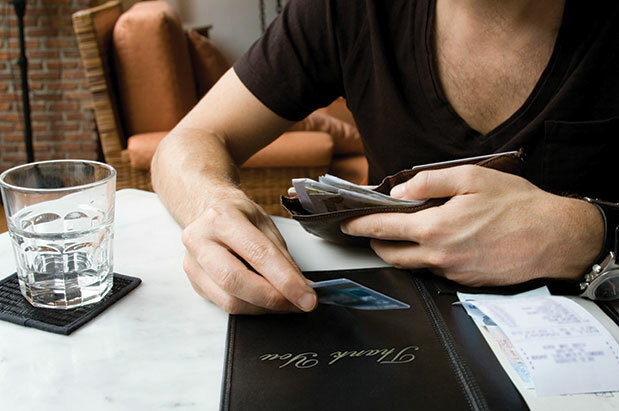 charge a flat 20 percent service fee on top of the price of dinner, in lieu of a tip. Servers make a commission based on the number of customers served. “The waiters are making the same, the cooks make more, 100 percent of the service charge goes to employees,” Douglas told me. The biggest concern of the diners I spoke with centers around the control that tipping represents. How motivated will the service staff be if a good tip isn’t dangling like a carrot at the end of service? Well, I’d argue that the model of tips as punishment versus reward is old and outdated. As much as we diners would like to believe that we’re affecting the quality of service by leaving a tip when the meal is over, when you think about it, it doesn’t even make sense. By the time the bill arrives, we’ve either received good service or we haven’t, our experience will bring us back or it won’t. Besides, many factors go into the percentage people leave: Do you tip on the pre-tax or post-tax total? Do you tip the same percentage for wine? Are you young or old? What have you been told is the “right” amount? Tips vary widely and there’s no rhyme or reason to them. “It’s not going to be comfortable overnight,” says Douglas. And both sides of the table have a bit of a learning curve ahead. Restaurants have to communicate their new pricing structures, and diners will have to adjust their recourse: Instead of leaving a poor tip when a dining experience is subpar, they’ll need to speak up. “Our goal is to have people talk to us. Tell us when something goes wrong,” Douglas says. He, along with the other restaurant owners I spoke with, says when bad service experiences happen, they will compensate customers. However, it’s also important to note that service in many casual restaurants has already diminished. As restaurants stretch their labor dollars, diners are increasingly expected to bus their own tables, to separate food waste from recyclables, to pour water from jugs left on tables and to fetch cutlery from tubs left on a side table. Should a service charge be issued in such instances, and if so, how much? The new finance models will take some getting used to. But they should allow for more equity between the service staffs and the often invisible laborers who prepare your food and clean up after you eat. It’s a shake-up for everyone, but it may be fairer for more of the staff. And that I can get behind.